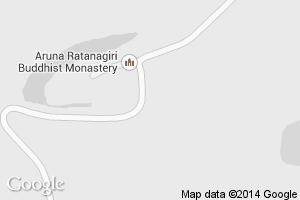 Aruna Ratanagiri: Harnham Buddhist Monastery is a Theravada Buddhist community on the border of England and Scotland. The abbot, Ajahn Munindo, received bhikkhu precepts from the late Venerable Ajahn Chah of Wat Nong Pah Pong in North-East Thailand in 1976. The monastery currently consists of monastic facilities for up to twelve sangha members and an adjacent lay retreat facility known as Kusala House.